One of the main goals in Synthetic Biology is to assess the feasibility of building novel biological systems from interchangeable and standardized parts. In order to collect and share parts, a Registry of standardized DNA BioBricks http://parts.mit.edu/registry has been established at the MIT. BioBricks can be assembled to form devices and systems to operate in living cells. Design of reliable devices and systems would benefit from accurate models of system function. To predict the function of systems built from many parts, we need to have accurate models for the parts and mechanisms to easily compose those part models into a system model. Therefore, in parallel to increasing the number of parts available and characterising them experimentally, a logical extension to the Registry would be to build a Registry of BioBrick models to complement the physical parts. A key aspect in this effort is the use of a description language able to describe and support the BioBrick concepts of modularity and abstraction. In this article, we demonstrate that such a Registry of BioBrick Models is achievable. A mock-up is provided based on the great flexibility and modularity offered by CellML http://www.cellml.org. 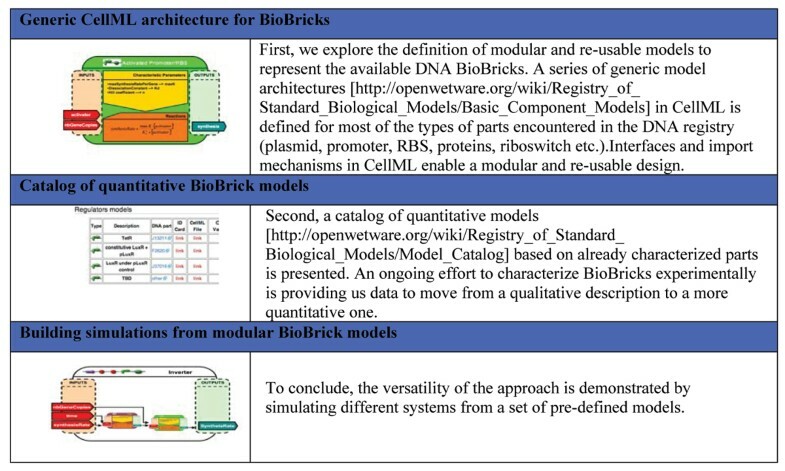 Following the steps of already successful model registries such as the CellML registry or BioModel registry http://www.ebi.ac.uk/biomodels/, a BioBrick Model Registry will enable the curation of models. Using CellML and a MIRIAM annotation scheme will guarantee compliance with the previously cited registries. However, a strong emphasis is made on coupling the DNA BioBrick characterisation with their corresponding models. An iterative process between qualitative modelling and experimental characterization will insure consistency. The proposed framework could be the foundation of a future CAD environment for Synthetic Biology. The concept of a Registry of BioBrick models based on CellML has been demonstrated. It takes advantage of CellML flexibility and modularity to provide a catalog of quantitative models which are standardized, modular and re-usable. With the increase of available physical DNA parts in the MIT Registry, as well as the characterisation of these parts, such a repository will help to provide a deeper understanding of the BioBrick properties and speed up the process of building new devices and systems. But more importantly, it will help to federate the growing number of contributions from the modeling community and build on the experimental characterization of BioBricks.